I’ve always loved reading. As a child, books always seemed to be in my hand. I loved the smell of paper and print. Bookshops drew me like steel filings are drawn to a magnet. 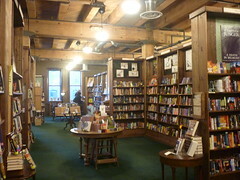 As soon as I stepped through the door I was transported to the worlds that my imagination conjured up inside my head. The same thing happens on opening a book by chance, perhaps in a second-hand book shop, and the book falls open at a certain page; then I find myself wondering if this was a favourite page of the original owner so I’m compelled to read on a little further until ultimately I have to buy the book so I can read it completely. Consequently my book shelves contain hundreds of volumes. Some are certainly the worse for wear, but all are familiar friends with whom I’ve travelled many miles. When my late husband and I decided to move to Cyprus, we never contemplated leaving our books behind. Fifteen years ago they all returned to UK, well-travelled, but not abandoned. Someday I may have to find other homes for them if I decide I need to downsize, or as one of my late friends said, to declutter. She and her lifetime partner made it a rule to move house every two years so they never gave themselves time to gather the detritus that inevitably ends up gathering dust. Trouble is, I get comfortable and I’ve grown fond of my clutter. Sadly the second hand book shops of my youth are rare. When we moved my collection had to be culled. I still miss some of my books but culling helped me to appreciate the ones I kept. Thanks for your comment. How did you manage to make such a hard decision? My thoughts entirely….Bob and I have all our own books and now Dads ! How could I possibly dispose of any of my childhood friends, theyre so precious and each book evokes different memories. A Kindle just doesn’t do it for me ! Good to hear from you Afton and to know your Dad’s beloved books are in good hands. you sound so like me! We’re all sisters and brothers when it comes to writing; we share a common love of words..
I’m just dusting off hundreds of books and polishing their shelves; in between I’m administering some TLC to those that need a little first aid which is why it’s taking forever – and then some, hence no posts, but only rushing to keep abreast of emails as I’m racing a deadline too. Thanks for taking the time to read and comment. I too have a lot of books but how to find a home for them; it is a difficult task nowadays. You are right. Shelf space becomes finite. Perhaps there’s something to be said for e-books after all? I have resisted, but am thinking it is the only logical solution to mountains of dusty books, or an annual slog with duster and brush! 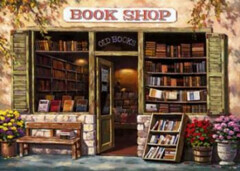 I miss browsing in bookshops, but have stopped buying physical books due to lack of space. Ebooks are a godsend for taking on holiday and long journeys by train, plane or coach.